All homes are different; from the style, material, and color, to the location. However, there are also plenty of similarities. One similarity that every home shares is its potential to have high levels of radon gas. Whether a home is young or old, radon can enter and build up to unhealthy amounts, making a home seemingly dangerous. Contact Advanced Basement Systems today for more information about radon testing and radon mitigation in Ontario. 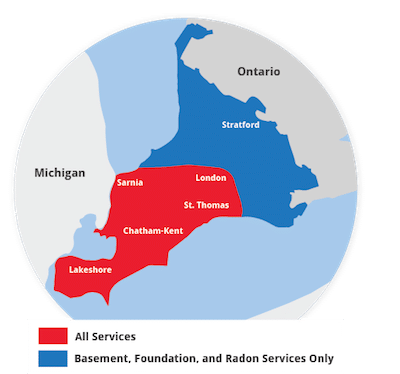 Advanced Basement Systems is a trusted member of the nationally recognized National Radon Defense network, and they have the training and experience to help lower the radon levels in local homes in London, Windsor, Chatham, Sarnia and nearby! There are the slab-on-grade foundations, and then there are the basement or crawl space foundations. All can sustain high radon levels and most homes' levels can be significantly reduced with radon mitigation. Some homes, however, are not as easy to mitigate, and some may actually not be receptive to any further mitigation. This is a very important detail that any homeowner may want to know before buying or selling a home. So how does radon gas enter a home anyways? Improve value. A radon mitigation system can increase your home's resale value. Most real estate agents request information about a home's radon levels. In Canada, this gas is measured in becquerels per cubic meter (Bq/m³). In the United States, radon is measured in picocuries per liter (pCi/L). Radon levels are separated into three levels of severity: high, 200 Bq/m³ and above; moderate, 100 - 200 Bq/m³; and low, 100 Bq/m³ and below. Health Canada recommends remediation (or mitigation) within 1 year for any levels above 200 Bq/m³. The Environmental Protection Agency recommends reducing levels in any environment in the U.S. containing 148 Bq/m³ (4.0 pCi/L) and above. However, the World Health Organization (WHO) recommends any European environment with 100 Bq/m³ (2.7 pCi/L) and above to be mitigated. What's the difference? Whether the levels are above or below 200 Bq/m³, Advanced Basement Systems can mitigate and reduce a home's levels to the lowest level. Advanced Basement Systems provides proper maintenance in order to check on the home and assure that the mitigation is effective. If you're considering having a home built, radon can still become a future problem. Radon is more expensive to repair later than to mitigate from the start. Ask the builder to install a radon resistant system as your home is being constructed. According to the United States National Association of Home Builders, one in six homes is being built with these systems. This means 200,000 homeowners are taking the initiative to protect their families before a home is even built. This is a worthwhile investment, and a viable option. Advanced Basement Systems is the local radon mitigation expert in Ontario including Chatham, London, Sarnia, Windsor, Stratford, Windsor , Leamington, St Thomas, Amherstburg, Strathroy, Essex, Ingersoll, Kingsville, Aylmer, Goderich, Hanover, Listowel and the surrounding area. We can thoroughly explain additional radon facts and the importance of understanding radon levels in a home. Contact Advanced Basement Systems today to learn more!